The Lakes Region Casino poker room has perhaps the prettiest setting of all of the New Hampshire poker rooms. Nestled about a half an hour above the state capital of Concord and 15 minutes below Laconia, this poker room sits on a hillside surrounded by trees. “Bucolic” is an understatement. The Loudon race track is just a few miles down the road, so things get crowded when events are happening there. Route 106 which passes in front of the casino is a gateway to the Eastern Edge of Winnisquam Lake and the southern edge of Lake Winnipesaukee. So the summer and fall vacationers provide some traffic. But mostly the Lakes Region Casino provides a relaxed country setting for players in central New Hampshire. 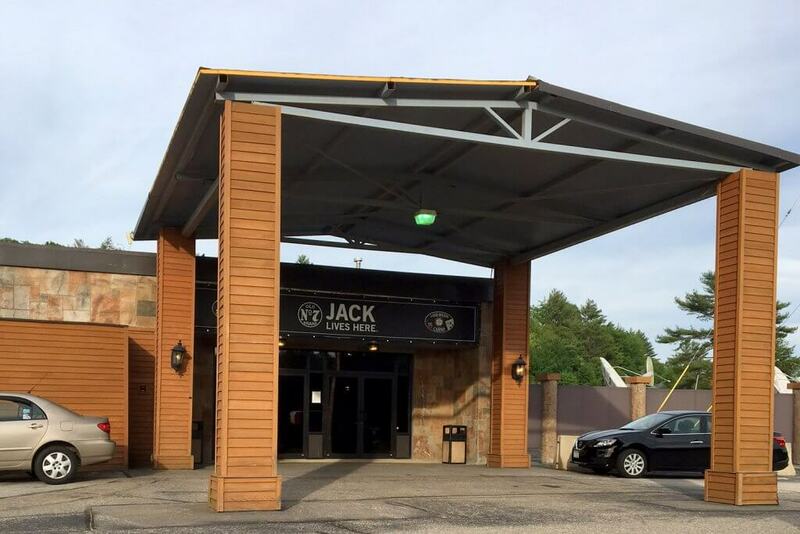 The exterior of the Lakes Region casino is in keeping with the surroundings: an attractive mix of wood and stone. The entrance has an attractive covered carport. It is a nice feature if you want to drop someone off when it is raining or for smokers on break seeking shade. When you enter the Lakes Region Casino you step right into the poker room which contains 10 poker tables, a roulette wheel, and blackjack table. The room is large, with plenty of space between tables and nice high ceilings. The poker room as a whole is clean and uncluttered and the rustic feel is preserved inside. There is a bingo room in back of the casino that operates 4 days per week. The building also holds Bluesology, a pub that serves the poker room and is a self-standing restaurant. Bluesology has a blues music decor, and a nice open atmosphere. The pub has about 10 beers on tap. It’s menu consists mostly of burgers, salads and traditional appetizers (e.g., potato skins, nachos, mozzarella sticks, chicken tenders). We did not sample the food. Observing the food ordered by others, it appeared to be pretty solid pub fare. At the time of this writing. the poker room is closed on Mondays and Tuesdays. The large room and high ceilings give the feel of fresh air flow. Air conditioning, as with most poker rooms, was working a little too well the day we visited. The lighting was very good, not too bright to be glaring, but enough to see your cards well. There were two medium sized TVs on one wall and a row of small TVs on another. No large screen TVs as some other rooms have. The tables were reasonably sized and fitted with new felts. Chairs were moderately comfortable, better than those at other New Hampshire rooms like Keene or Seabrook, but not as comfortable as the nicer Las Vegas rooms. The chips were clean, but were so worn that it was difficult to tell one denomination from another across the table. In fact, you had to be careful to sort your own chips correctly, as some of the edge colors were worn clear off. One notable downside to the Lakes Region Casino was that the cell reception is terrible in the mountains, and the room’s wifi is spotty at best. The dealers, floors, and wait staff were all very pleasant. The wait staff circled frequently and were very responsive. They even passed out free shots of blueberry vodka at one of the breaks (I passed). Dealer skill levels were highly variable. Some dealers were very slow and deliberate. One was frequently confused as to whose action it was, and did not seem to know how to split a pot. Other dealers were more skilled and attentive. Overall, the dealer skill level was typical for most small rooms in New Hampshire. The floors were on top of the tournament action, announcing blind increases in a timely manner, and always available when there were questions. The Friday night tournament we played was pretty small. It maxed out at 26 players over 3 tables. There were 2 cash tables going as well, and the blackjack table got active after the dinner hour. The tournament players skewed older than the average tournament we have played elsewhere. Play was odd. The players were probably the most loose passive I have seen. Most players were in 50% or more of pots, even when blinds got big. People limped with their entire range too: I have never seen so many limped premium pairs. While a couple of players may have been trapping, others just seemed content to limp with QQ and see if they dodged aces and kings on the flop. I raised big early with AK, and got 4 callers out of 7 at the table. One woman called an all in with Q9 suited against KK, and flopped her flush. The loser in the hand could not get out of the room fast enough. Some of the play may have been fueled by the fact everyone knew one another. All of the other players seemed to be regulars. Players were very friendly, but clearly knew each other’ styles and would comment good-naturedly about others’ tendencies. The Lakes Region Casino has tournament scheduled every day that they are open. The Wednesday, Thursday and Sunday tournaments are typically low buy-ins (e.g. $20 for 8K starting stack), with lots of add-on and rebuy potential. We played a Friday evening (5pm) tournament with a more straightforward structure: $60 buy-in, 20K starting stack, 30 minute blinds. A pretty darn good structure for $60. Saturday tournaments rotate in structure a bit, and some have bounties. The variety of buy-ins, most still $100 or below, is a nice feature. Someone who wants to throw down $20 and take a shot with a small stack, can do so. Or add on as needed within their budget. All of the Friday and Saturday tournaments represent pretty good value for the buy-in amount. The blind structures are more aggressive than the $90 or $150 buy-ins at our favorite site Hampton Falls. But Hampton Falls serves as a high water mark for value. 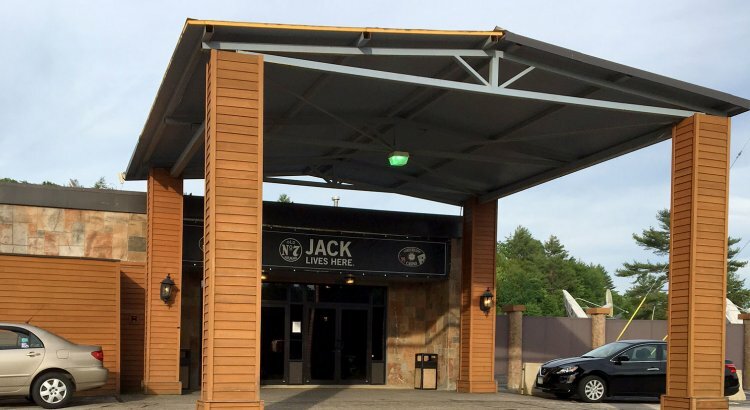 Lakes Region Casino is certainly in the next echelon. The Lakes Region Casino is also ahead of most of the New Hampshire rooms with their adoption of the big blind ante. Freeing the dealers from having to attend to table antes was very helpful in moving things along, especially with some of the weaker dealers. Another nice aspect was the voluntary bad beat buy in. 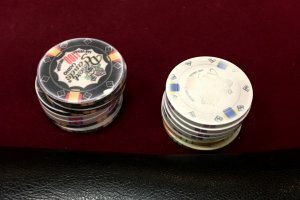 Rather than taking more money out of the pot for a tournament bad beat, players were offered the option to voluntarily contribute to the bad beat (and thus be eligible if it hit). I would love to see more rooms adopt this policy. The tournament clock was a random display of numbers. It never corresponded to the number of players or the levels or the time left in each level. Not sure it if this is a consistent problem or just a glitch on this evening. The Lakes Region Casino is remote, but picturesque. It’s a nice stop for any poker player vacationing near the New Hampshire lakes region. For the tournament player, it provides some great value: low buy-ins with decent structures. Tournament play requires adjusting to very loose passive play, but if you adjust it can be an enjoyable and likely successful, experience for more skilled players. If you can enjoy the setting and the pleasant staff and players it will make tolerating the uneven dealer quality easier. Overall, the Lakes Region Casino is a nice experience for the casual player looking for a low intensity small room. The Lakes Region Casino is remote, but picturesque. It’s a nice stop for any poker player vacationing near the New Hampshire lakes region. For the tournament player, it provides some great value: low buy-ins with decent structures. Tournament play requires adjusting to very loose passive play, but if you adjust it can be an enjoyable and likely successful, experience for more skilled players.